The Reef Hotel Casino always puts on one huge party for St Patrick’s Day, and 2019 is no exception. The annual Celtic Craic Party this year is getting the band back together so to speak, bringing Celtic rockers Claymore back to the North and reuniting them with long-time friend Damien Leith for a massive weekend party. It will be the first time Damien and his band have performed on the BAR36 stage, and with the addition of Claymore – the two often share festive stages – audiences are guaranteed a Celtic extravaganza! To add to the frivolity, there will also be special guests The Kroovs on the Saturday night to get the entertainment really heating up. Get ready to celebrate this auspicious Irish festivity – it won’t just be about leprechauns and four-leaf clovers, its all about great music and getting your party-pants on Celtic style! Damien Leith has many strings to his bow – acclaimed singer-songwriter, author, playwright. 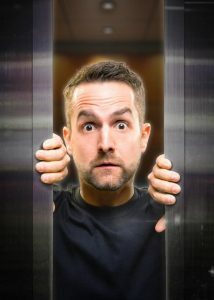 It has been over a decade since he smashed into the national consciousness on television talent program Australian Idol, and since then Damien hasn’t stopped working. He has nine albums and two novels to his credit, plus a children’s story app, and has toured the width and breadth of Australia and beyond. He has turned his vocals to performing gorgeous Irish tracks, which saw the release of his 2015 album Songs of Ireland, to his tributes to the greats like Roy Orbison (Roy: A Tribute To Roy Orbison, released in 2011) and his most recent Gospel album, released earlier this year, performing the songs of Elvis’ Gospel career. Melbourne-based Claymore are renowned as one of the world’s premier Celtic rock bands, and for good reason. An evening in the company of the band always demands audiences to be on their feet from the onset. They’re a regular at the reputed Festival Interceltique De Lorient France, and a local festival favourite on the bill of events such as Queenscliff, Port Fairy Folk Festival, and have even played the Big Day Out. In everything they do, Claymore, defies all expectations. The talented multi-instrumentalists not only manage to combine traditional elements of Celtic music, but they take that passion and soul and rock it right into the 21st century. Few bands can pull off the sensitive task of re-educating the traditional realm into the modern day, but that’s something of a specialty for Claymore. Not only that, but they manage to write beautiful original Celtic compositions, and even lend their style to some power rock classics, all with an Irish and Scottish twist. Although many Celtic bands may come and go, each sounding remarkably like the other, the point of difference with Claymore is within the term ‘rock’. They add a current flavour, and interestingly, an inherent Australian-sound, to their music, bringing ole time traditional themes into the future, and appealing to audiences young and old. From the penetrating beats of the bohdrahn in the battle songs of the Jacobite rebellion to the hypnotising drone of the pipes in the evocative love ballads of Scotland and Ireland, fans of the band find themselves conquered by the most fiery and delicate textures of Celtic music. 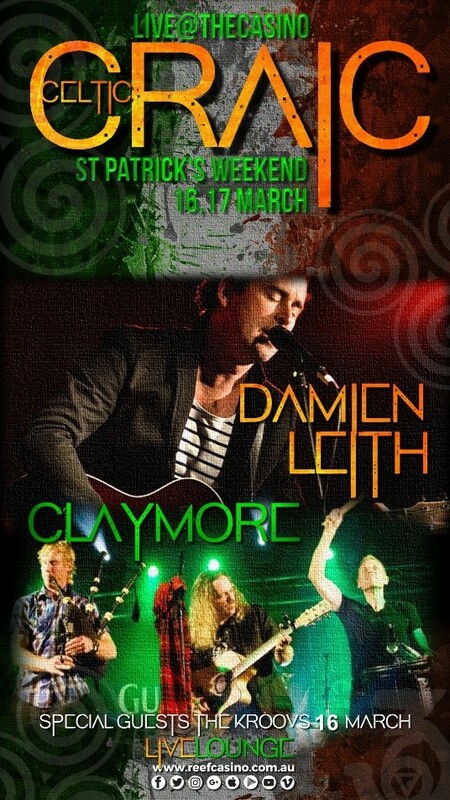 Damien Leith & Claymore perform at BAR36, The Reef Hotel Casino this St Patrick’s Day weekend – Saturday 16th and Sunday 17th March 2019. Entertainment kicks off with The Kroovs on Saturday 16th at 7.30pm. The St Paddy’s Day Sunday Session starts on Sunday 17th at 6.30pm.